Shopsmith 20" Scroll Saw - Feature-For-Feature, It's a Hands-Down Winner! Carefully Engineered To Save Your Time and Out-Perform Cheapie Scroll Saws! It's delicate enough to saw thin veneers or inlays, intricate fretwork or mother-of-pearl -- yet powerful enough to slice through brass, bone, plastics and hard or soft woods up to a full 2" thick with ease and safety. 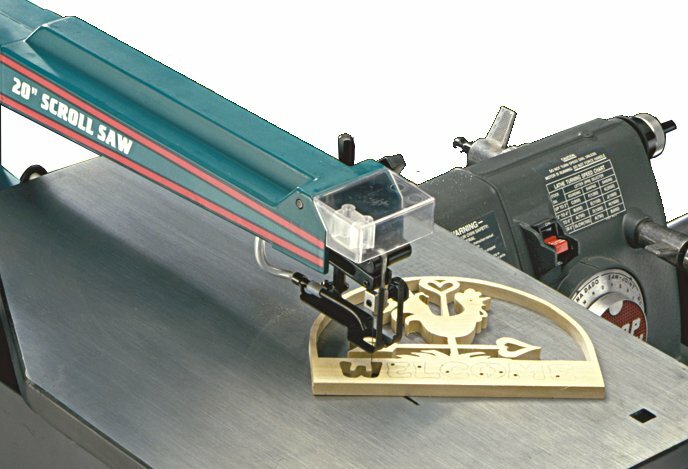 Its special blade blocks hold all 5" plain end fretsaw or jigsaw blades from 1/4" wide down to super-fine blades for making extremely intricate cuts. 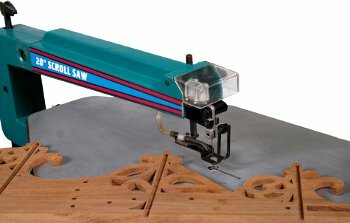 And, where old style jigsaws only powered their blades on the down stroke (making smooth cuts in thick wood almost impossible), Scroll saws power their blades on both the down (cutting) and up (return) stroke. This constant tension action delivers far more positive control over the cut and helps prevent premature blade breakage. 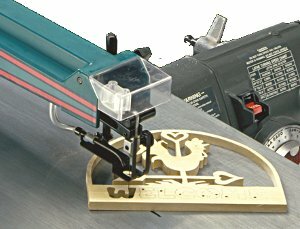 And, with a little practice, your cuts will be so smooth you won't have to do any sanding at all! Infinitely variable speed range - Select from 700 RPM (280 strokes-per-minute) to 2800 RPM (1200 strokes-per-minute) with a Mark V --- or --- 450 RPM (180 S.P.M.) to 2800 RPM (1200 S.P.M.) with a PowerPro-equipped MARK 7. 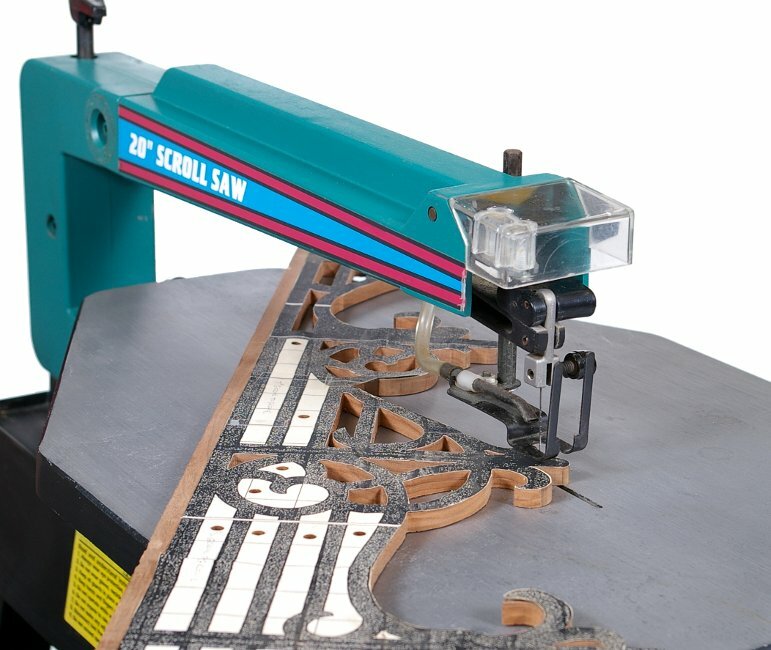 No other scroll saw offers this infinitely variable speed capability ! Huge 16" x 23-1/2" Worktable - provides more than enough support and throat depth (a full 20") for your largest projects. Tilts to 45° in both directions on a direct-reading quadrant, then locks solidly with a quick twist of a single knob. Fast, 30-Second, Tool-Less Blade Attachment - A quick quarter-turn of the blade-locking thumb nuts is all it takes! No tools or time-consuming fumbling required! 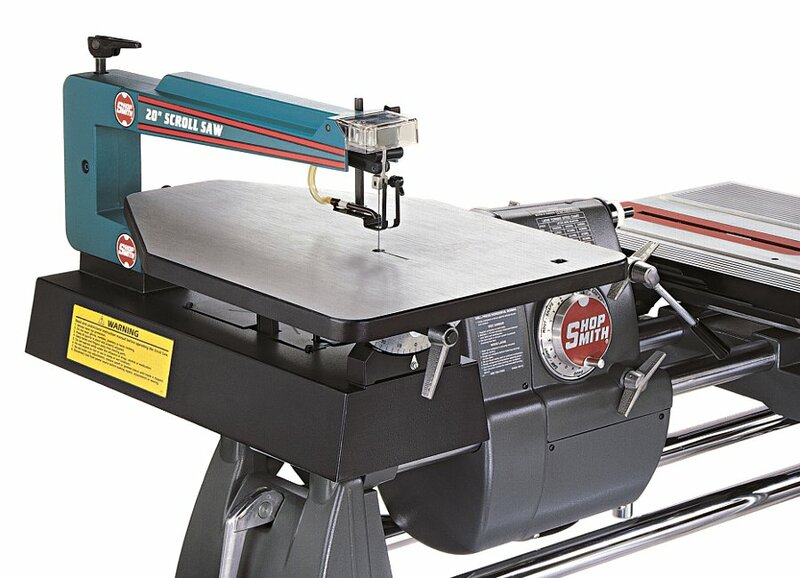 Dual Blade Tensioning Controls - give you a rear, flip-up Lever for instant primary tensioning ...plus... an up-front release for rapid tensioning when removing and re-inserting blades through workpiece cut-outs during internal piercing cuts. Clear, See-Through Upper Guard - lets light in, then flips up and out of the way for quick, tool-free blade changes. Hold-Down With Dust Blower - provides vertical blade guarding plus a single knob height adjustment and a built-in blower to keep your cutting line free of sawdust and debris at all times. Heavy, Zinc-Alloy Table & Base - dampen vibrations for super-smooth running. Table Size 16" x 23-1/2"